Today I have my second polish form the Divas and Drama Collection! Manipulative is the one I was most looking forward to, I love this type of minty blue/green. I think it looks nice on my skin tone even though I'm olive skinned, and this one even has an iridescent shimmer to it which makes it even more of a winner in my books! I used three coats for these photos. I found the formula really draggy which was a bit annoying, but I just used a really thick final coat to even it out, which did the trick. I thought this polish would be perfect to try out the Wicked Fast top coat that I got with my order. I absolutely love it! I'll still use Seche Vite for nail art because I love how it doesn't drag the pattern, but for normal nail polish, this could be my favourite top coat! It dries so quickly and really gives the polish a plasticky finish which I love because I don't get any scratches or dents! I got a bit pic heavy with this one, see the rest of the photos after the jump! 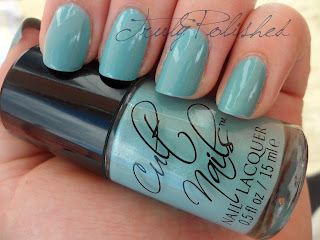 I love this polish so much, this will be one I'll be wearing A LOT as it gets sunnier, if it ever does. We're on a yellow weather warning for rain tonight, so it'll be soooo wet in the morning! Just right to get me in the mood for my holiday to Malta on Thursday!!! I pre-ordered this as part of the collection, but now you can buy it here at Cult Nails for $10, it's definitely worth buying, it's so pretty and probably my favourite of the collection! Very pretty, such a nice summer colour! I absolutely love it! SUCH a pretty colour!